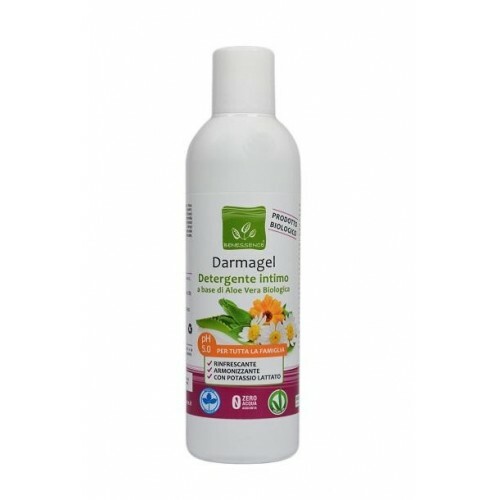 Darmagel Organic Intimate Cleanser with Aloe Vera, Benessence. Refreshing, harmonizing and with potassium lactate. Ideal for the whole family! 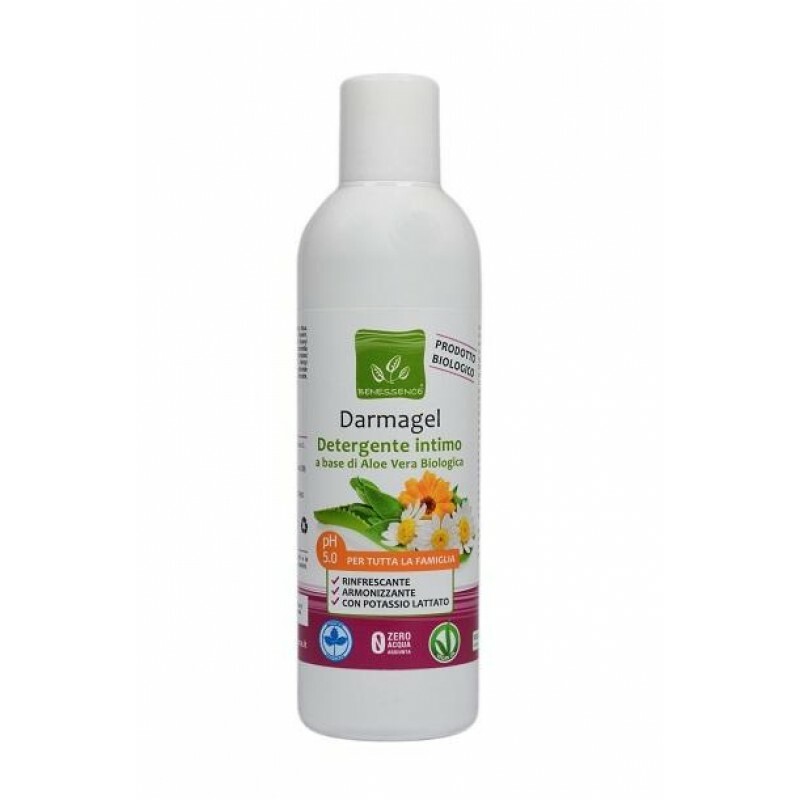 Darmagel is an intimate cleanser based on pure Aloe Vera juice. It is characterized by a not too acid pH, thanks to the presence of lactic acid, which makes it suitable for both male and female intimate hygiene. Cleanses gently, leaving the skin soft and fresh all day long. Aloe vera juice is extracted from the Aloe Barbadensis Miller plant from organic cultivation, rich in active ingredients (vitamins and derivatives: A, B1, B2, B6, B12, C, thiamine, riboflavin, niacin, folic acid and beta-carotene ; essential and non-essential amino acids, enzymes, mono- and polysaccharides, mineral salts, sterols). The formula combines the regenerating and moisturizing action of Aloe Vera with the soothing and flaming action of Chamomile and Calendula extracts, helping in the event of irritation and itching. Burdock extract and potassium lactate are ideal for the most delicate areas, in fact thanks to their anti-odor purifying properties, they determine an anti-inflammatory and natural antibacterial action. How to use : Pour a dose of product on the palm of the hand, apply, emulsify and rinse thoroughly, repeat the operations if necessary. Do not expose to heat sources and keep away from children. Being totally natural, the product can vary in color and consistency without losing its qualities. Ingredients : Aloe Barbadensis Miller leaf juice, Aqua, Coco-glucoside, Cocamidopropyl betaine, Glycerin, Potassium lactate, Disodium lauryl sulfosuccinate, Glyceryl oleate, Calendula officinalis Flower Extract, Chamomilla recutita Extract, Arctium lappa Root Extract, Hydrolyzed wheat protein, Helianthus Annuus Seed Oil, Benzyl alcohol, Sodium chloride, Tetrasodium glutamate diacetate, Citric acid, Lactic acid, Sodium benzoate, Potassium sorbate, Dehydroacetic acid, Parfum (hypoallergenic fragrance).